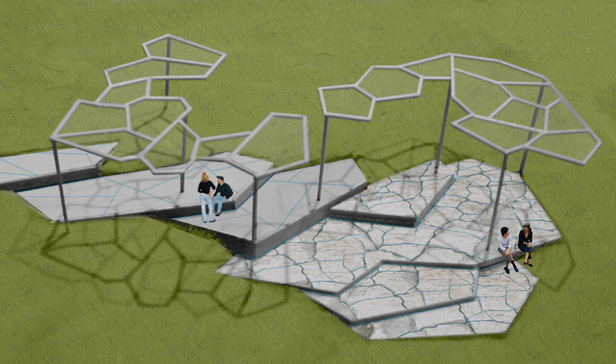 The unique geometry of the serpentine rock informs the structures for the proposed interventions at the Serpentine Art and Nature Commons, a 20-acre park on Staten Island. Seating, trellises and walkways are carefully sited to make visible the natural processes of the site, as well as facilitate use by the community. 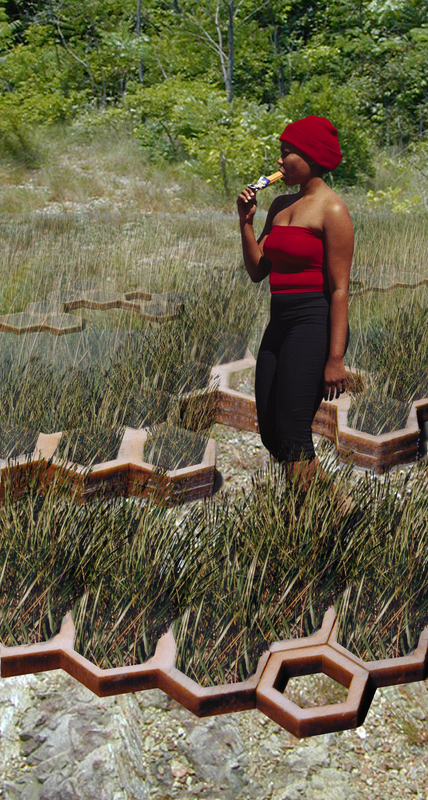 Modular hexagonal elements interlock to create a new path surface and, at the hilltop, a series of terraces, while also stabilizing the soil and correcting erosion problems. Re-vegetation with plants endemic to the serpentine soil will restore an ecologically rare and valuable plant community. Chain link fencing currently demarcates the Van Duzer Street boundary of the Commons, with an unmarked entrance leading to a small flat area at the base of the hillside. 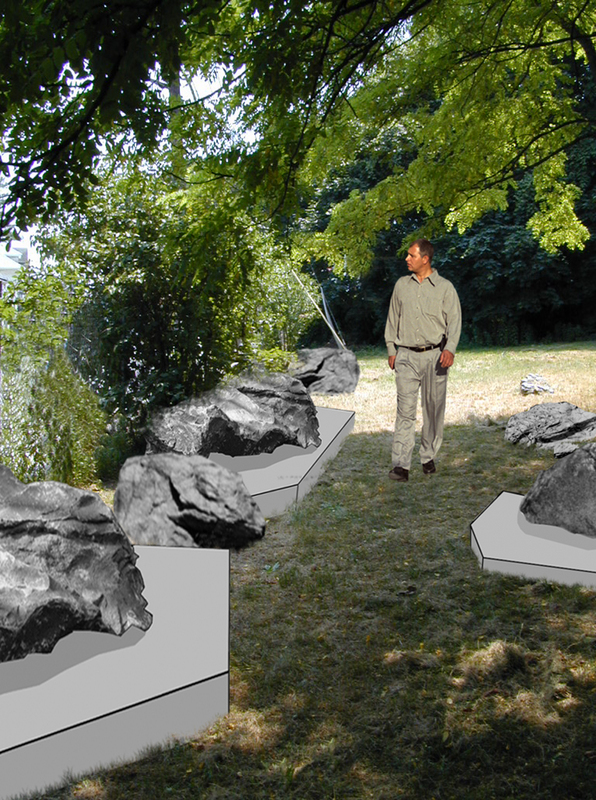 Serpentine boulders collected from the site are proposed as an alternative to the fence. A number of the boulders are set within concrete forms, extending the implied edge, while also allowing informal seating. New planting will serve to further delineate the park and new entrance. In the first phase of the project, stepped terraces fit in the base of the hillside and spread across the width of the open area, following the direction of the natural contours. The same color as the serpentine, stone pavers give the terraces the appearance of natural forms extruded from the parent rock. Gaps between the pavers channel and collect the rainwater, repeating the pattern of the rock formations and demonstrating the flow of water. The terraces serve as seating and trellises overhead, reiterating the fractured rock formation, define gathering spaces. The existing paths will be stabilized and improved through the use of an interlocking hexagonal concrete paver; the opening in the center is filled with gravel, allowing the path to be permeable. Problems associated with compaction and concentrated flow of water will be eliminated by the use of this system. 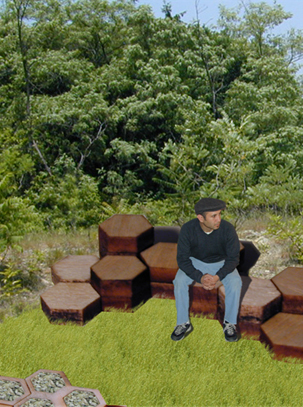 Larger hexagonal elements, stacked to create seating at a variety of heights, will provide areas to rest along the path, as visitors climb to the lookout area above. 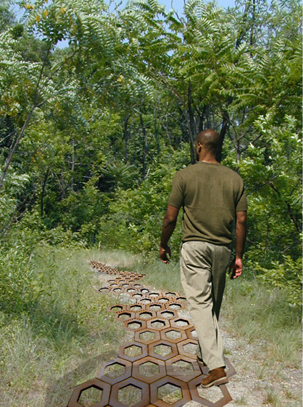 Seating will be located at natural drainage areas, where corrective drainage techniques will protect the path system and provide suitable habitat for a range of plant species. Winding past the series of small seating areas, a path leads visitors to the serpentine hilltop. 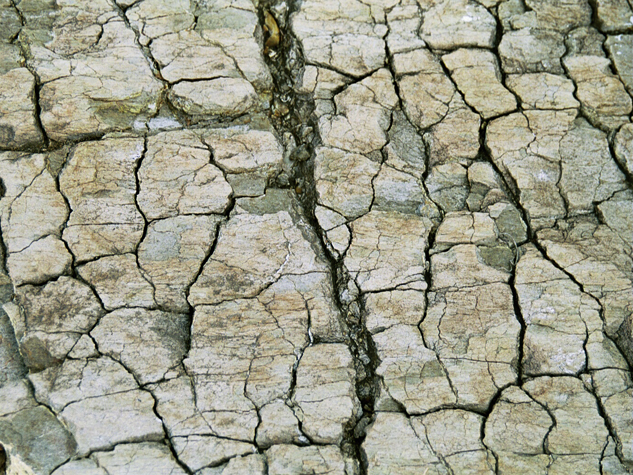 Due to illegal construction activities in the 1970’s, erosion and poor soil conditions produced an unstable slope and thwarted vegetation growth. To stabilize the disturbed area, the hexagonal modules are stacked to retain the slope, forming a series of flat terraces. Plants will further anchor the modules, as soil and grasses will be used to fill the hexagons along the perimeter of the terraced area.